One of Captain James Cook's official artists painted the first image of Antarctica, new x-ray analysis shows. But the painting had remained hidden for more than two centuries, as the artist had painted the landscape of a New Zealand bay over it. A depiction of the Antarctic icebergs in a rough sea, and the painting that obscured it, "A View in Pickersgill Harbour, Dusky Bay, New Zealand", are now on display at the UK's National Maritime Museum in Greenwich. The icebergs painting is displayed only as a photograph to avoid destroying the over-painted scene of the tropical rainforest at Pickersgill Harbour. William Hodges joined Cook as the official landscape artist on his second voyage aboard the Resolution in 1772. His painting of Antarctica was the first eyewitness view of the southern continent ever captured, the museum said. Artists often re-used canvases on long voyages. And Hodges, who until now was almost forgotten, probably painted over the original image as the untouched paradise of Dusky Bay appealed more to the artist's aesthetic temperament. 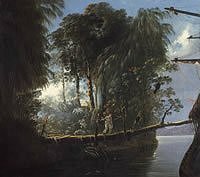 Hodges was a classically trained pupil of Richard Wilson, known as the father of English landscape, and was influenced by the ideal landscapes of French 17th century painters such as Claude Lorraine. So, Hodges was not likely to have been naturally drawn to the terrors of the polar seas. Instead, he painted the dense, cool temperate rainforest, showing its ferns, creepers and giant trees. Hodge's works have not been shown to the public since 1795. At that time, his solo exhibition was considered dangerously radical during what was a period of war with revolutionary France, so the exhibition was shut down. Hodges was the first professional painter to see both the Antarctic and Pacific Oceans, but was forgotten soon after his death in 1797. Author of the book Captain Cook's World, John Robson, said it was always interesting when something new about Cook arose. "However, the likelihood with Hodges painting is that it is of icebergs rather than the Antarctic continent. Cook and his ships crossed the Antarctic Circle but did not actually see the continent itself. It would be great if the painting proves otherwise." If it weren't for the accompanying photograph I would have speculated that the underlying painting was of a polar bear in a snowstorm done entirely in white gesso. 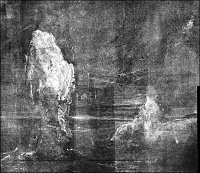 "One of Captain James Cook's official artists painted the first image of Antarctica, new x-ray analysis shows. But the painting had remained hidden for more than two centuries, as the artist had painted the landscape of a New Zealand bay over it. " This is a "Gods, Graves, Glyphs" -- Archeology/Anthropology/Ancient Cultures/Artifacts/Antiquities, etc. PING list. Please FREEPMAIL me, if you want on or off this list. How did they know to look with X-Rays? Did I miss the answer somewhere? Or did they just assume there might be something because artists at sea reused canvases? Sorry, can't answer your questions. How did they know to look with X-Rays? Very common to paint over paintings, to erase lettering and rewrite. Looking underneath is getting common, and sometimes they find something interesting. There is a word for parchments so treated--palimpsest. Or something like that. Team leader Greg Jeffreys says a row of four cannons suggests the ship was a European military exploration vessel from the 17th century. "The cannon definitely are not English cannon. We know the style of most of the English cannon, so we are looking at a European ship - probably 1650s around that era," he said... Jeffreys says as the ship is excavated other finds such as dinner plates, glasses, weapons or money could provide more accurate evidence of its origin. Captain Cook is credited with being the first European explorer to find and chart Australia's east coast in 1770. Just updating the GGG info, not sending a general distribution.